If you had been handed a Trade dollar back in 1877, you wouldn't have been sure what to do with it, as its status of being legal-tender had recently been revoked. Some people claimed they were silver dollars and worth as much while others correctly said that they were only worth their silver value. The 1893-O Morgan dollar is a rather mysterious Morgan dollar as not much is known about it, coming from a period when there were a number of scarce Morgans. It was quite easy for the 1893-O to be overlooked. The 1916/16 Buffalo Nickel could be considered to be the king of Buffalo nickels. It does not matter if it is the errors or regular dates or the 1916/16 doubled die, it still ranks as one of the toughest dates of the Buffalo nickel series to acquire. Gold has been the most sought after metal in nearly every civilization as far back as can be remembered. Granted you can’t drink gold, you can’t really eat it or drink it, or use it as fuel. Even though it doesn’t satisfy any of our basic necessities, it is still highly sought after. Silver half-dimes predated five-cent pieces alternatively known as nickels and even coexisted with them for many years. The Mint struck half-dimes from 1794 to 1873. Half-dime mintage numbers were low and intermittent before 1829. As silver dollars go, most coin collectors immediately think about Morgan silver dollars. Much less often does the Peace silver dollar come to mind. Perhaps most collectors concerns focus on price or rarity as opposed to a coin’s historical importance or beauty. Where Have All Of The Trade Dollars Gone? Many of the best U.S. coins have disappeared over the years. The mintage totals for many of these coins would suggest that there should be more of them around than what is actually the case. A hoard of buried gold was found by a California couple walking their dog in February, 2013. 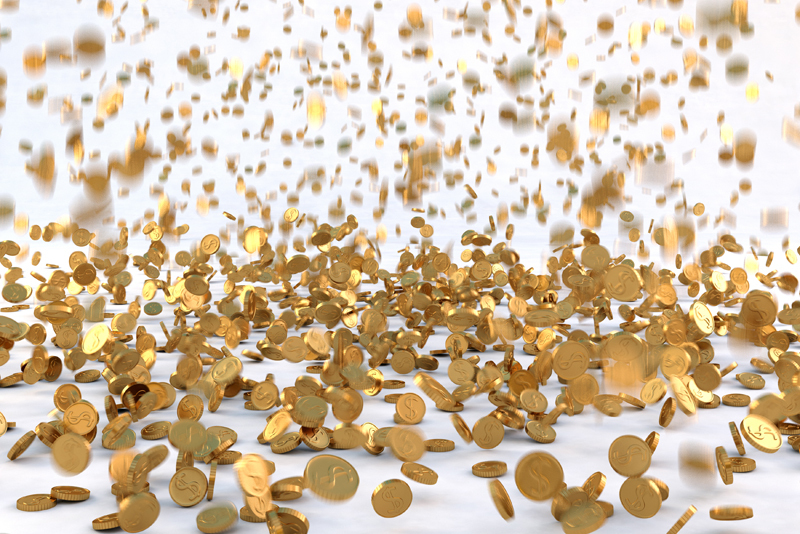 The hoard of gold coins has been estimated to be worth at least $10,000,000. 1815 is a special year as it is the only year that a cent coin was not minted in the United States. Collectors who specialize in collecting coins from that year, have few examples to choose from. The 1909-S VDB Lincoln cent is not exactly rare to find. While there is a good supply of the coins around, it is not the easiest one to find. Approximately 484,000 pieces were issued which caused an immediate collecting sensation. Proof coins are considered to be the finest examples of medallic art. Anyone who collects proof coins would certainly agree. These specially made coins are struck more than once, thus showing off every detail of that individual coin’s design. In the Walking Liberty half-dollar series there are two 1917-D halves and neither seems to attract much attention from collectors. The 1917-D Walking Liberty mintages started out in a normal manner. Should Our Currency Be Revalued? An editorial in a major weekly coin periodical advocates the need to revalue our currency. The article points out the fact that many major countries have revalued their money over the years while we have not significantly changed ours in over 200 years. The Peace dollar was the last of the silver dollars. Despite having several low mintage numbers, it is still possible to assemble a set of Peace silver dollars. Some of these silver dollars were issued during some difficult economic times. A slot in a Whitman folder has the space for a certain 1916 quarter filled in with the circular part and had it marked “rare.” Today this decision could easily be disputed that the 1916 Standing Liberty quarter is really rare. The 1964-D Peace silver dollar remains an enigma. The 1964-D Peace dollar is supposed to be the only U.S. coin of the 20th Century to have been struck, then melted in its entirely. If you are looking for a sleeper then you may like the 1913-D Barber half dollar. Virtually everything concerned with it screams that it has been overlooked. How Many Coin Denominations Are Enough? How many coin denominations does this country need to support the public’s buying needs? The current coin denominations are the penny, nickel, quarter, half-dollar and the dollar. Much discussion has been had over the last year or so to eliminate the penny. Steel cents were first struck in 1943 to help win the war. Copper was badly needed for shell cases and electrical equipment during the World War II period. Steel cents were minted to reduce the amount of critical war materials going into coins. The story of the Morgan silver dollar is related more to the silver that the coins are made from. For many years, the U.S. Mint had trouble finding enough silver to make the coins that were needed. That situation changed considerably when silver was discovered in Nevada in the late 1850s. If you shop at your local grocery store, you are often asked if you want paper or plastic bags. In the future, when Canadians pay for stuff, they will have two choices: plastic or plastic. The Walking Liberty half dollar has won many praises and criticisms in its time. Adolph Weinman’s Walking Liberty design was more than an attempt to beautify the half dollar. It represented a concerted effort to revitalize the denomination and to get half dollars back into circulation in again. In the 19th century there were a number of coins that flopped and were not popular with the public at large. In more modern times, the various dollar coins have never caught on with the public for making purchases. Most are either in storage or squirreled away in people’s homes.